SmokinLicious Smokin' DustÂ® is a wonderful way to add flavour to fragile food items like fish and vegetables, which do not require long smoking times. Or, you can use the dust during a long smoking session with meats and poultry to add that extra "kick" of flavour. Smokin' DustÂ® can be used in smoking drawers of gas grills, in stovetop smokers, sprinkled in commercial grade smokers and in cold smoke generators. Smokin' DustÂ® is made from air collected and screened "wood flour" from Wild Cherry, Sugar Maple, Red Oak, White Oak, Alder, Beech, Hickory and/or Ash hardwoods. Remember, only the "heartwood" of the wood is used in our gourmet wood products so you know its premium quality. 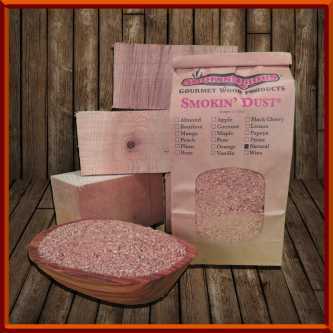 We are pleased to offer our Smokin' DustÂ® in a 4-Pack! Do some "Buddy Buying" and purchase an assortment with a friend or two as a little Smokin' DustÂ® goes a long way! "I mixed about 3 tablespoons of Smoking Dust with my regular cherry wood sawdust. I had no issue with the temperature going hotter. I was a bit concerned when I opened the bag of dust... I was worried that because it was so fragrant that it would overpower the finished product. Instead it brought to the forefront the subtle flavour of what wood type was being used. You have a very good product there and I'm looking forward to trying it on my offset soon."